Luxury abounds at the non-smoking Delamar Southport where guests relax at the spa and enjoy complimentary buffet breakfasts at the on-site restaurant. Bright red awnings are the only clue that this traditional white clapboard boutique hotel holds an elegantly modern interior. The three-story Delamar boasts 44 non-smoking rooms ranging from studios to suites some with fireplaces and kitchenettes and each uniquely decorated with contemporary accents. Guests relax in bathrobes enjoying amenities such as flat-panel TVs available Wi-Fi and room service. The hotel's restaurant serves a complimentary breakfast buffet and features outdoor dining and a lounge. After working out in the fitness center book a treatment or relax with a steam shower at the on-site spa. Travelers catch up on work in the business center and get directions from the 24-hour front desk or concierge. Pets are allowed for a fee. Parking is free. Note: This property charges a $15 daily service fee and will be collected by the Front Office prior to check-out. 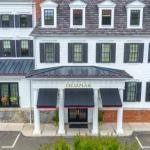 About an hour from Manhattan and 35 minutes from New Haven the Delamar is just off I-95 and Route 1. The shops and restaurants of Southport are within walking distance and the beach overlooking the Long Island Sound is one mile away. Watch a play at the Westport Country Playhouse four miles away or drive 15 minutes to the Beardsley Zoo. About 12 minutes away Norwalk offers an IMAX theater aquarium and seaport as well as galleries and restaurants. The train station is an eight-minute walk Tweed New Haven Regional Airport is a 28-mile drive and LaGuardia Airport is 48 miles away.